Just because daisies are a common flower, doesn’t mean they aren’t a special one. Daisies are native to Northern Europe but can be found in North America, Australia, Africa, South America and even Iceland and Greenland. The word daisy comes from the Old English language, “day’s eye” because its petals blossom at dawn and shut at dusk. What is considered a nuisance member of the weed family can also be used to supplement gardens and yards. Celebrate the tenaciously beautiful daisy every year on January 28. This iconic ad began with a three-year-old girl picking daisies in an open field and ended with a nuclear explosion. It helped Johnson clinch the election. Juliette Gordon Low, AKA "Daisy" held the first Girl Scouts of America meeting in Georgia with 18 girls. The botanist Paul Dietrich Giseke records daisies as part of the composite family. Although daisies have white petals and a yellow center, using water and color dye, you can easily turn a bunch of daisies into a colorful bouquet. A great prop for a photoshoot, video shoot, or outfit, a daisy crown is also easy to make. You can tie together the stems into a circle to fit above your head or glue the flower heads to a thin piece of twine. Venture out into nature or your local park and find some daisies to bring home. Liven up your living room with a fresh vase full of sunshine. Daisies grow naturally in the wild, and as part of the weed family, they can be considered to be a nuisance. But because they are a perennial flower and don't need much attention, they make a great addition to a flower pot or garden. In its home country of England, the daisy is also called a bruisewort. 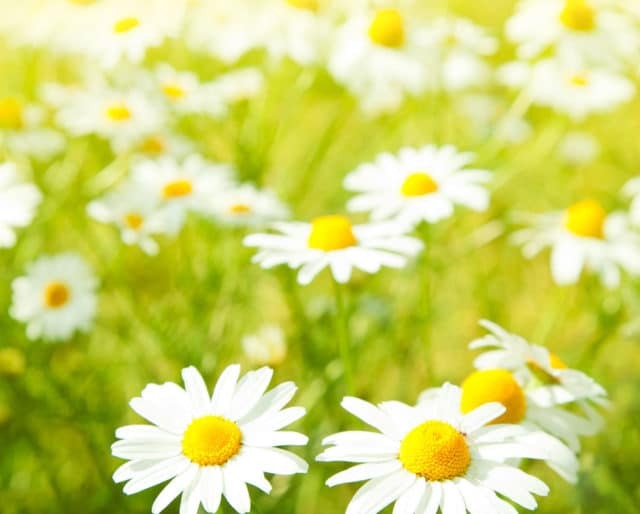 As an old time holistic remedy, the daisies' crushed leaves were used to soothe bruised and blemished skin. They're pretty AND useful! Daisies are a symbol of youth and innocence and are often associated with children.